Pioneers in the early days of cycle production, Rochet introduced a variety of tricycles and triporteurs in the 1920s and 1930s. 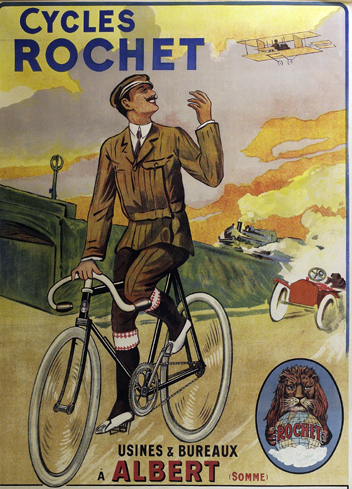 Though its bicycles and tricycles are no longer easy to find, people are still familiar with the company because of its range of artist-designed cycling posters. The cable-operated rear drum brake is unusual. And the two-wheel steering is different from the conventional Ackerman design used on most these tricycles. The equal wheel size makes the tricycle more stable than usual. Cycles Rochet was one of France’s early bicycle manufacturers. The company was originally from Lyons, starting as stonecutters before moving into cycle manufacture in the 1890s. The Paris showrooms were opened in 1903. Its factory, at Albert, Somme, was destroyed in 1914.